I'm going to have to speed up posting on the backlog of posts on my trip to Kuala Lumpur and Singapore last month. Gosh, was it just a month ago? The folks at Royal Selangor did an excellent job of making sure that we enjoyed our trip. We were taken on a walking tour around KL, on a tour of RS' factory and showrooms, and meals were carefully planned at restaurants that reflect the different cultures and cuisines of Malaysia. Restoran Sin Seng Nam is one of the remaining old Chinese (Hainanese?) coffee shops in KL. 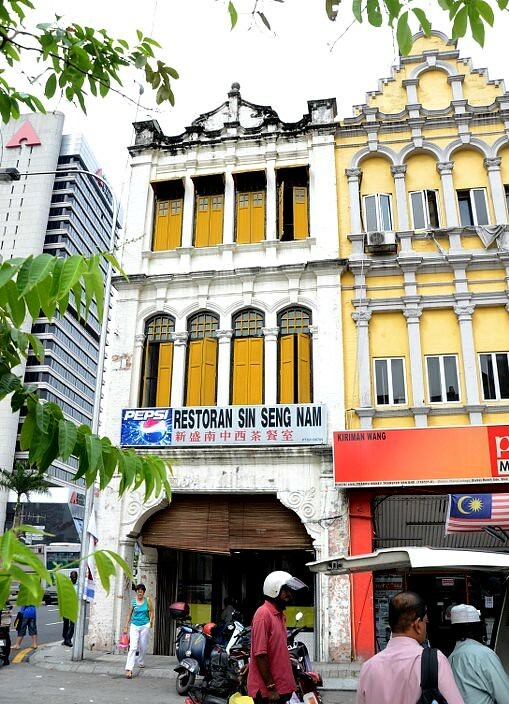 Yut Kee is the more famous old-style Chinese coffee shop in KL but it closes Mondays. We were directed upstairs because the ground floor was full. I love old, high-ceiling restaurants such as this. There's so much character and history in every corner, tile, table, window and even the ceiling fan. Reminds me of Journal Canteen in Melbourne. 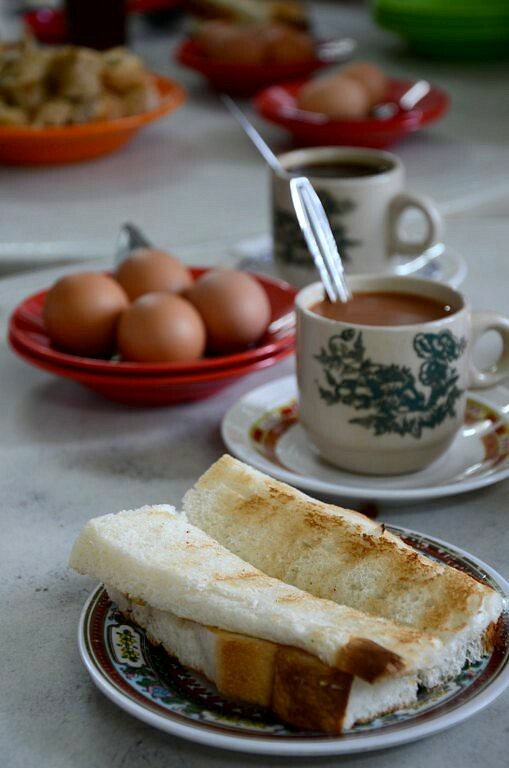 The standard brekkie in such types of restaurants consists of charcoal fire-toasted bread, sandwiched with kaya (a custard-jam made of coconut milk and eggs) and butter. Thick, strong local coffee in old mugs are another must, as are coddled eggs. Coddled egg--not half as good as Yut Kee's. 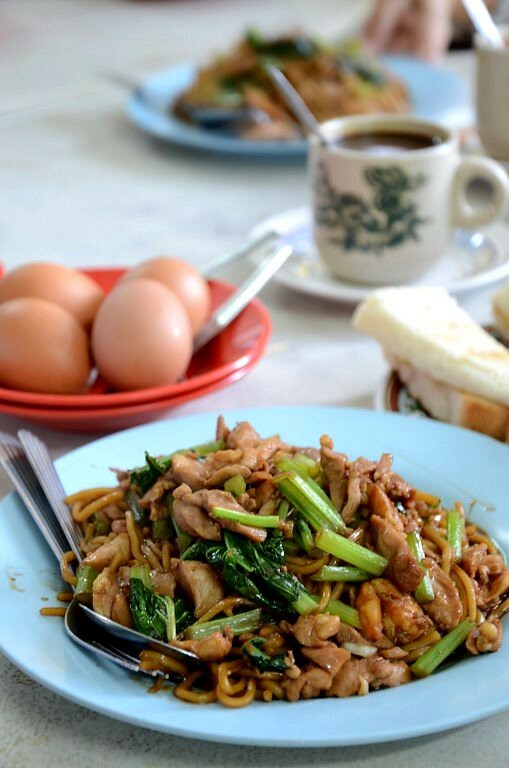 Fried noodles may seem too heavy for breakfast, but in Malaysia, it is eaten anytime of the day. Cheong fun is flat rice noodles with a sweet sauce but here it's topped with stuffed okra, beancurd skin and fried fishballs. A bit too much variety for me, as I prefer plain cheong fun. It was a good breakfast. 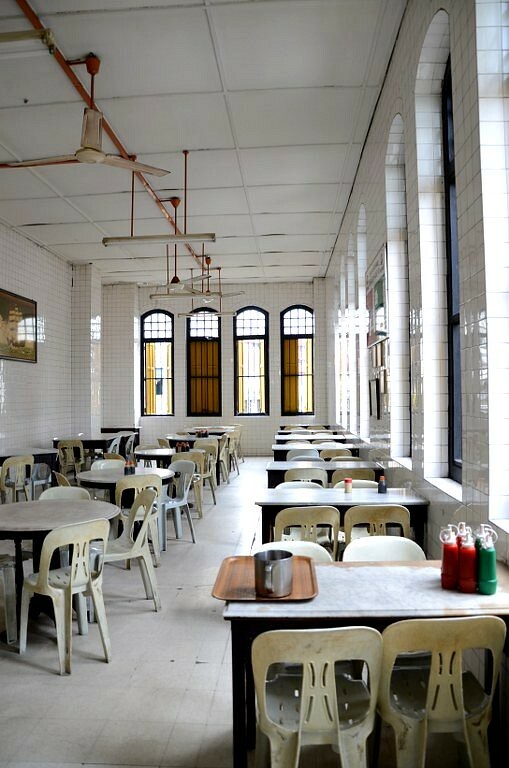 I'd go to Sin Seng Nam for the rustic interior and the architecture around the area but for the food, I'd stick with Yut Kee. 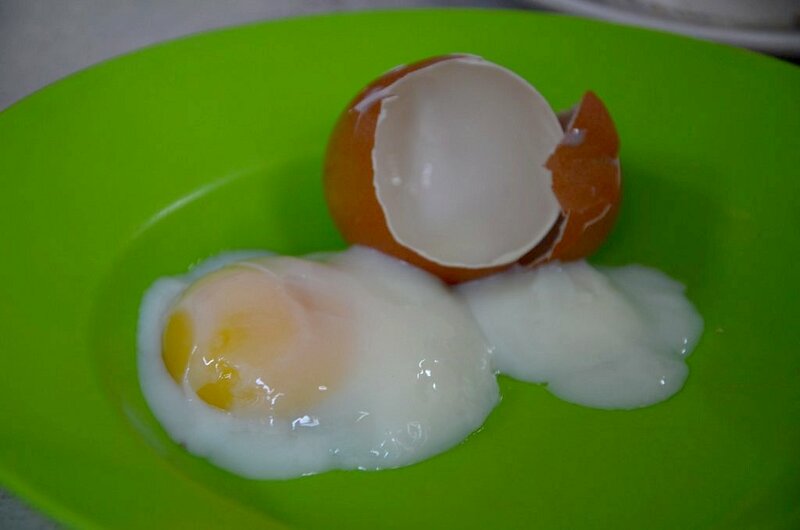 Maybe I'm just biased because I love the coddled eggs at Yut Kee. food is ok. nice chicken rice. unfriendly service. I agree that Yut Kee is better overall, both food and service. I just went there this afternoon. Any I was too late for their curry chicken, no choice, take chicken rice, none the less, at RM4.00, it is still taste good. Sometime ago, we met Francis Yeoh of YTL dining there alone, with body guard.... he does not carry loose change, thus, the body guard paid, he ordered chee cheong fun. 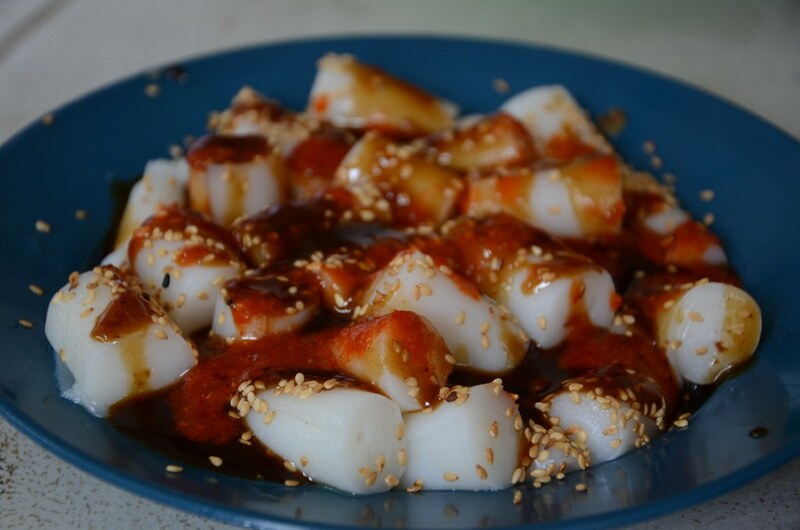 I grew up with chee cheong fun with 'yeong chap'( stuffed okra, fishball, stuffed chillies etc.) and I love it, bring back my childhood memories. Sometimes, we had the soup from the boiled yeong chap, quite good though. I haven't been to Yut Kee and Sin Seng Nam for a long, long time. Reminder to revisit when I'm back to KL next. anon: ok, another dish to try. i don't mind bad service in a chinese restuarant. just don't tip. anon: i'll go again next trip n see if i still prefer yut kee better. mich: i was a little bit disappointed the first time i went to yut kee but i think i'm liking these types of coffee shops more and more. anon: really, francis yeoh goes there? i guess he eats too after all lol. mg: oh those things are called yeong chap. i like them in soup, like in steamboat and lukluk. 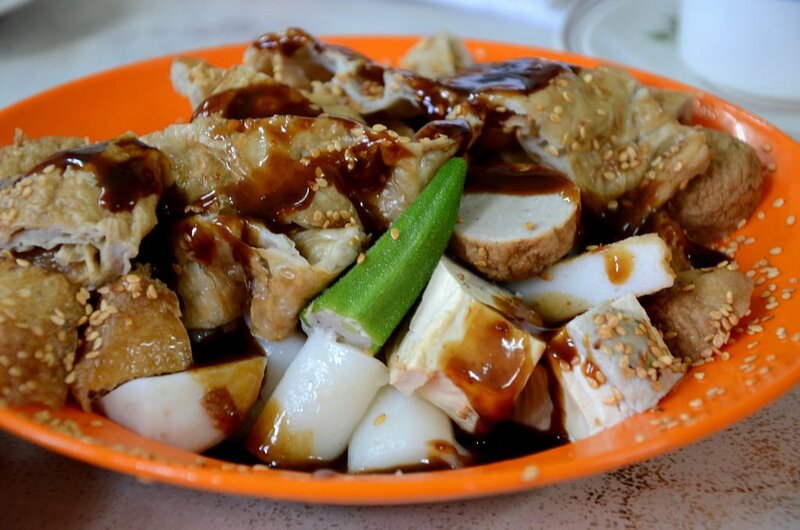 i think i prefer plain cheong fun bc tt's how they are served here. it's an acquired taste i suppose. Hi is there any place in KL where I can learn to make Hainanese Kopi ? I am from India and want to learn this traditional Kopi.